Select Corporate Housing, a family-owned business that has been in operation since 1997, provides an important service to people who are new to the Charleston area, as well as to those who are in the process of packing up and moving elsewhere. "It is an extension of our first family-owned business, Furniture Rentals, Inc., established in 1973, and both entities work together," explained Director of Operations Scott Blalock. "We provide temporary flexible housing for corporate clients, the military and construction companies." "We work with a network of realtors to provide temporary accommodations for those buying and selling a home," Blalock said. "It is also a nice way to keep clients on both sides happy while waiting for the market to work in their favor." Select Corporate Housing offers the comforts of home to people who are away from their family with a wide range of accommodations, including apartments, condominiums and even residential homes, with a 14-day minimum stay. Properties undergo a rigorous inspection before clients move in. "We have chosen to be the premier quality leader in the corporate housing industry," Blalock pointed out. "This means if you are not 100-percent satisfied with your accommodation, we'll make it right." Select Corporate Housing takes customer service to a high level, employing one of only 25 certified Bed Bug K-9s in the country. "Tracker," a beagle, regularly inspects Furniture Rentals, Inc. warehouses and residences clients are interested in occupying. "People have a real fear of bed bugs and for good reason. We have four handlers for Tracker, and we are willing to go anywhere his services may be needed," Blalock commented. Blalock, who has been involved with the family business most of his life, realizes how essential the company's services are to people who must work away from home or who are in the process of relocating. "Our housing is much more convenient because you can choose a place that fits your lifestyle. We can work with any set of needs or budgets," he pointed out. 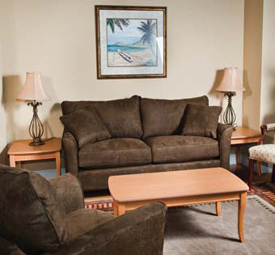 A standard list of accommodations includes quality furnishings from Furniture Rental, Inc.; housewares such as pots and pans, linens, silverware and shower curtains; televisions and DVD players; a washer, a dryer, a microwave; and cable and Internet services. Clients also enjoy the ease of having utilities included, such as electric, gas, water and trash pick-up. "We can meet any necessity that individuals may have, from maid services to a concierge or even a grocery shopper," said Blalock. "If someone wants to live downstairs or needs deep-water access, we'll find it." Select Corporate Housing employs a highly trained staff of customer service representatives at each of its four main locations: Augusta and Savannah in Georgia and Columbia and Charleston in South Carolina. "We have a network of partner vendors across the United States so we can set you and your family up anywhere nationwide," Blalock added. The ease of not living out of a suitcase and enjoying privacy is unmatched by hotel chains, and Select Corporate Housing also is more affordable. "Utilizing our temporary flexible housing makes it much more convenient when families come to visit," Blalock said. 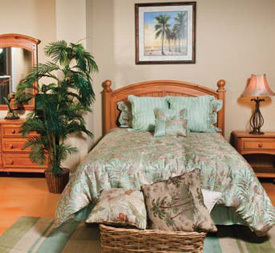 "Other relocation companies don't provide furniture, while we have an entire furniture company on hand. Who wants to bother furnishing a place that is only temporary?" 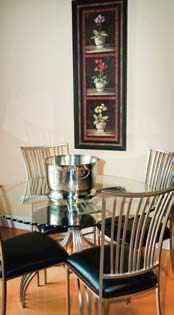 Select Corporate Housing operates in South Carolina and throughout the Southeast. For more information on temporary flexible housing, visit www.selecthousing.com or call (800) 896- 7290. 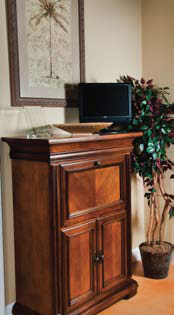 To learn more about Furniture Rentals, Inc., go to www.furniturerentals.com or visit the company's showroom in Charleston. © 2019 iLoveCharleston.com, Charleston Vacation Information. All Rights Reserved. | Advertise on this web site for FREE!